Behind the apparent disorder, Tokyo’s current skyline in fact complies with complex rules. While the first towers in Tokyo appeared in the late 1960s, the “verticalization” of the city has in reality taken place over two distinct periods: the 1980s – the era of the construction of the global city – and the 2000s – Tokyo’s renaissance. Since the 2000s, the skyline has tended to respect certain spatial codes, specific to the Japanese context, against a backdrop of dynamic tension between the global on the one hand and national appropriation on the other. For a long time, Tokyo’s skyline has remained relatively low-rise, compared to American cities, with a maximum authorized height of 30.3 metres (100 shaku), which can be attributed to the construction techniques and earthquake-proofing standards of the early 20th century. 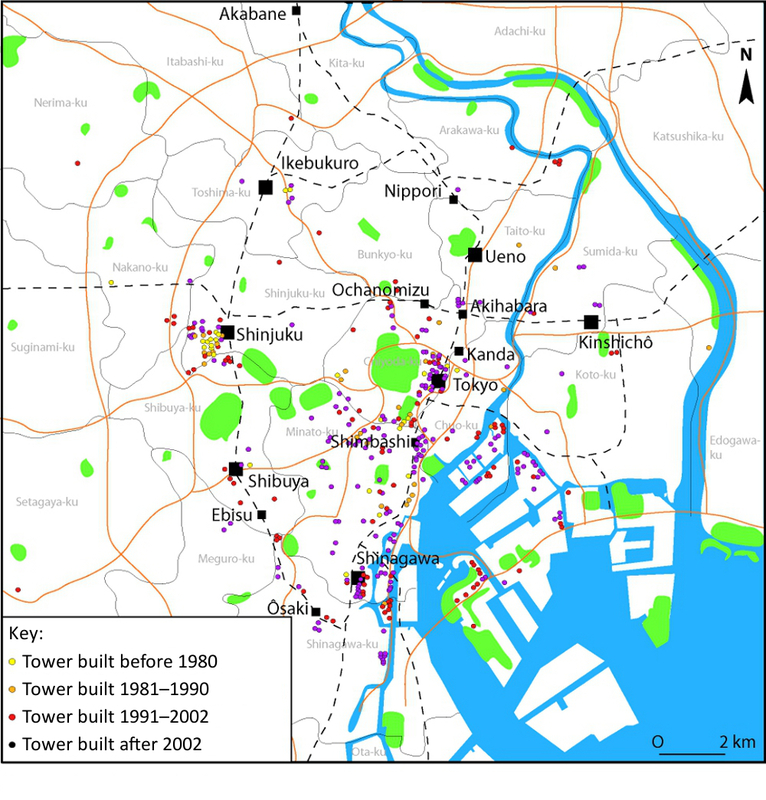 While the city’ first skyscraper (158 metres) was inaugurated in 1968, it was only from 1980 onwards that the number of tall buildings in Tokyo truly began to proliferate (Aveline-Dubach 2008). This late emergence of verticality represents a true turning point, and is due to the dual specificity of its implementation: first, indirectly, via a system of zoning based on land-use coefficients that seeks to restrict the height of buildings; and second, operationally, via two series of liberal  policies that gave rise to the tall buildings of the 1980s and 2000s. The Japanese urban-planning code frequently makes use of zoning-based approaches. In the 1950s, the 1919 Building Code was reformed in order to harmonize the nature and size of buildings by zone. To this was added a system of exceptional arrangements relating to building heights (and, from 1963, land-use coefficients). In 1968, the “New Urban-Planning Law” introduced urban-planning perimeters, which sought to restrict urbanization to spaces on the edges of existing urbanized areas. The “verticalization” of city centres compensates this sprawl control. The creation of verticalized skylines in large Japanese cities took place in two stages, according to two quite different approaches. The 1980s were a major turning point. The financialization of the economy and the speculative bubble (1985–1991) affecting land and real-estate values (Aveline-Dubach op. cit. ), combined with the Urban Renaissance Law of 1986, explicitly encouraged verticalization and led to the creation of the first verticalized business districts. While the restricted size of plots in these districts makes it difficult to build towers, it was possible both in Marunouchi, where Mitsubishi Jisho dominates in terms of land ownership (Languillon-Aussel 2013), and in the Shinjuku neighbourhood, where urban wasteland was redeveloped. The result was the emergence of a skyline in accordance with the Western model of the global city  (Appert and Montès 2015), but where the towers built were above all opportunistic and where the resulting landscape appears disordered. When the property bubble burst, the new Urban Renaissance Law, voted in 2002, sought to stimulate production of the urban fabric in central areas (Morishita 2006; Languillon-Aussel 2013). One of the effects of this law was the renovation of business districts, with small, dilapidated buildings replaced by major redevelopment projects. As the map below (Figure 1) shows, the period heralded by this law was the most productive in terms of verticalization, with a proliferation of tall buildings in central areas and on the sea front (86 towers over 150 metres in height were built between 2000 and 2012) (Perez 2014, p. 612). Above all, the verticalization of the 2000s is the result of value-capture operations involving land consolidation in a context of falling land prices. Source: Global Cities & Buildings Database – www.skyscraperpage.com. The emergence of high-rise construction in the form of towers housing offices and luxury hotels represents a break with the traditional Japanese sense of space, symbolized in particular by the development of the vice-centre  of Shinjuku, essentially built on a concrete deck in the 1970s (Falquet 1993). It is at this point that Tokyo truly gained a skyline, in the sense of a verticalized silhouette typical of the global city. In Tokyo, the skyline is self-referencing: it is disconnected from its immediate surroundings, dialoguing instead with the different heights of its various components. These towers embody the power of individuality, as opposed to the contextu, which embodies awai, the culture of collective “interlink”. In this respect, the 2000s represented a second break with the past: although the skyline was not always developed in a holistic manner, there was nevertheless a return to aesthetic concerns, more in line with a Japanese style and way of doing things, that sets it apart from the generic, international skyline of the 1980s. The concept of ma is central to this new approach. Ma is a key notion in the organization of space in Japan. Typically translated as “spacing”, ma is, according to Augustin Berque (2004), an interval in concrete space-time. Ma presupposes a spatial and temporal context that gives spacing a meaning or value that goes beyond mere emptiness. It concerns the skyline in its capacity as the “glue” of the interstitial space between urban “peaks”. Although the skyline is essentially composed of voids, the specificity of the Japanese case – expressed in terms of ma – makes these voids a separate element of the object as a whole. It was on the basis of ma that the philosopher Hamaguchi Eshun founded the Japanese culture of “interlink”, which he called awai, an alternative reading of the character ma (Eshun 2003). This notion of interlink or awai can be considered the opposite of the Western culture of individualism, and indeed the individual is replaced by the contextu on the scale of cultural and social values. Unlike in the West, where individualism still has a direct link, in architectural and urbanistic terms, with perspective and, more recently, with skylines and towers, the Japanese contextu gives the spaces between buildings a specific meaning that distinguishes it from the notions of “interval” or “void” encountered in the West. It is in this way that we can interpret recent changes in Japanese attitudes to tall buildings, which have seen the integration of more local features. The Tokyo Sky Tree tower symbolizes this return to a Japanese sense of space, incorporating numerous national references: its shape, resembling a Japanese sabre plunged into the ground; its anti-seismic structure, inspired by traditional five-storey pagodas; its shopping centre, with features borrowed from shōtengai (traditional covered shopping streets); its height, 634 metres, which can be read in Japanese as “mu‑sa‑shi” (for 6‑3‑4), Musashi being the former name of the province of Tokyo in the Edo era. Its height therefore has historic connotations in addition to contributing to the fierce competition for prestige among Asian megacities  (Languillon-Aussel 2012). The Sky Tree has renewed the use of ma in the dialogue engaged by its antenna spire with the streamlined silhouette of the five-storey Senso‑ji pagoda, the Buddhist temple on the other side of the Sumida River, which separates the two. Height is the result not just of urban-planning rules and a culturalist approach but also of the unspoken rules of Japanese society. For example, the Marunouchi skyline, despite its apparent spontaneity, is in fact organized according to a gradient whereby building heights as we move away from Tokyo Station and towards the park where the Imperial Palace is located (see Figure 2). This gradient responds to two rules. The first, implicit, relates to the deference of Japanese society to the Emperor, who remains the symbolic keystone of the Japanese social and political system. Long considered a living god, the Emperor was invisible and untouchable. This tacit rule of invisibility explains why building heights become gradually lower on the approach to the palace, as if the city is “prostrating” itself in a sort of reverential bow, ensuring that the white-collar workers in the neighbouring business district cannot see the Imperial Palace (see Figure 3). This is another manifestation of ma, and of the asymmetric dialogue that it reveals between the global city and imperial power, redolent of tensions between the economic and the political, or between the international and the national. The second rule, urbanistic in nature, relates to the conservation of built heritage. Faced with the impossibility of making use of the potential vertical space above Tokyo Station for heritage reasons, this potential height has been sold as supplementary building rights for neighbouring towers, via a practice known as floor-area transfer. Thanks to this practice, a standard deregulated land-use coefficient of 1,300%  can be increased by around 500 percentage points, as in the case of the Marunouchi Park Building (land-use coefficient: 1,530%), the Tokyo Building (1,702%) or the Shin-Marunouchi Building (1,760%). This explains why the highest buildings can be found in the vicinity of Tokyo Station. Source: Global Cities & Buildings Database (www.skyscraperpage.com)/Raphaël Languillon-Aussel. Source: ABLE CITY 2008 report, p. 45/Raphaël Languillon-Aussel. The development of the Tokyo skyline oscillates between discontinuity and continuity – discontinuity because the integration of height into the urban fabric has temporarily disorganized the cultural structures of the Japanese urban space; and continuity because the tall buildings in question respect a certain number of unspoken rules, such as ma (aside from a temporary lapse in the 1980s) or imperial power. As a sign of belonging to the highly competitive club of global cities, Tokyo’s current skyline is the result of opportunistic encouragement of height, in particular in a limited number of central spaces: centres and vice-centres for office towers, and the sea front for residential towers. From a landscaping and architectural standpoint, the skyline of the 1980s leaves little room for a holistic approach: the skyline as an object does not seem to exist except in the form of juxtaposition effects. The developments of the 2000s would partly change this vision, with composition effects and a degree of dialogue between towers or between spaces, and with a renewed interest in more specifically Japanese references, both in the architecture of the towers built and in the way neighbourhoods were developed. This enables us to qualify the sometimes overly Western vision of the urban landscape in Tokyo as “visual disorder” (Daniell 2008), which appears to be due to Japan’s inability to restructure cities on smaller scales. Appert, M. and Montès, C. 2015. “Skyscrapers and the redrawing of the London’s skyline: a case of territorialisation through landscape control”, Articulo. Journal of Urban Research, special issue 7, “Tales of the City”. Aveline-Dubach, N. 2008. Immobilier. L’Asie, la bulle et la mondialisation, Paris: CNRS Éditions. Berque, A. 2004. Le Sens de l’espace au Japon : vivre, penser, bâtir, Paris: Éditions Arguments. Daniell, T. 2008. After the Crash: Architecture in Post-Bubble Japan, New York: Princeton Architectural Press. Eshun, H. 2003. Awai no bunka to hitori no bunka (“The culture of interlink and the culture of the individual”), Tokyo: Chisenshokan. Falquet, J.-C. 1993. “Shinjuku, urbanisme et environnement d’un quartier d’affaires”, Historiens et Géographes, vol. 342, pp. 247–258. Languillon-Aussel R. 2012. “Mujô, nagare, fukkô : entre tradition et modernité, le Tokyo Sky Tree et la culture de l’impermanence, du flux et de la renaissance au Japon”, Transtext(e)s Transcultures, vol. 7. Morishita, N. 2006. “Tokyo: trends in urban planning”, City Planning Institute of Japan Newsletter, no. 25, “Trends in urban redevelopment in central Tokyo”. Perez, R. 2014. “The historical development of the Tokyo skyline: timeline and morphology”, Journal of Asian Architecture and Building Engineering, vol. 13, no. 3, pp. 609–615. By “liberal policies”, we are referring to the deregulation of urban-planning laws and the Japanese building code, encouraging private projects involving the construction of very tall towers in city centres. Since the late 19th century, Westernized elements have appeared in the urban landscape in Japan – for example, Tokyo Station, inspired by Centraal Station in Amsterdam, or the controversial Westernized architecture of the National Diet Building. “Vice-centre” is a literal translation of the Japanese term “fukutoshin”, used by the Tokyo metropolitan government to refer to secondary centres within the Tokyo region. Ma is a component of many Japanese words and expressions, such as chikama (vicinity), harema (clear/sunny interval), fukuma (romantic intimacy) or ma mo naku (a phrase expressing immediacy, literally “not even a ma”) (Berque 2004). By “peaks”, we mean prominent features in the built fabric and the urban landscape. The Sky Tree was originally intended to have a height of 600 metres, but this was increased by 34 metres following the completion of a 600‑metre tower in Guangzhou in China in the year preceding the Sky Tree’s inauguration. A land-use coefficient of 100% means that the building’s total floor area is equal to the surface area of the plot. A land-use coefficient of 1,300% thus means that the building’s total floor area can be up to 13 times the total surface area of the plot, which necessarily implies building upwards. A certain number of spaces do not count towards the total floor area, such as communal areas and staircases.